Gaza and Ukraine: What Is the Objective? Control, Diversion – or a Third World War? Like many people, I have been trying to better understand the world’s chaotic events, particularly those unfolding in the Middle East and Ukraine, which have recently peaked with the Gaza warfare and the sudden upsurge in Western hostility toward Russia and Vladimir Putin. There appear to be three possible explanations for what is going on. (1) Methodical installation of puppet regimes. Concerning Gaza, Kevin directed me to an article by Alan Hart which suggests that Israel may be planning to ultimately install Mohammed Dahlan – believed by some to be an Israeli asset – as Palestinian president in a rigged election. Concerning the Arab Spring, Kevin commented that “It’s 4th generation warfare aiming at permanent destabilization and balkanization,” and directed me to a post regarding Western attempts to destabilize Pakistan. In studying the posts and recent events, a common denominator occurred to me: all the upheavals seem to entail regime changes and installation of puppets. Following the Western-backed overthrow of Gadaffi in Libya, Zionist front man Basit Igtet was proposed as the new Libyan President. And when former Ukrainian President Viktor Yanukovych backed off of IMF loans and EU membership, he was overthrown in a now-too-typical Western-backed “popular uprising.” Ukraine’s new president, Petro Poroshenko, is only too happy to accommodate the IMF and EU. In Syria, another U.S.-supported “popular uprising” has been trying to send Assad the way of Gaddafi, Mubarak, and Saddam Hussein. Last year’s false flag in Syria – the allegation that Assad used chemical weapons on his own people – failed to produce the air strikes Obama so eagerly sought. Clearly, the banksters wanted Assad replaced by another Zionist puppet. Over the Ukraine crisis, Western propaganda is running full tilt against Putin. This accelerated right after the MH17 tragedy, despite paltry evidence that Russia had anything to do with it; Putin, of course, had no motive for downing a Malaysian airliner. Now the White House has announced Russia has violated a 1987 nuclear arms treaty – even though this violation was already known about last year. Clearly, the Obama administration is grasping at straws in its effort to rally EU support for sanctions against Russia. What is the objective? Citing Putin’s remarks before the Russian Security Council, Dr. Henry Makow recently observed that “Russia is under attack by the globalists who wish to exploit internal divisions to destabilize Russia and install a puppet.” Is that the endgame here? To force Russia to replace Putin with a sycophant for the globalist bankers? A man who will not take Russia off the dollar (see below)? I am no expert on the internal affairs of any of these nations. However, there appears to be a pattern, and one could argue that the Zionist Illuminati bankers are trying to eliminate, one by one, every leader who opposes them, replacing them with compliant stooges. While this may be nothing new in the world of realpolitik, I have never seen it undertaken this systematically before. 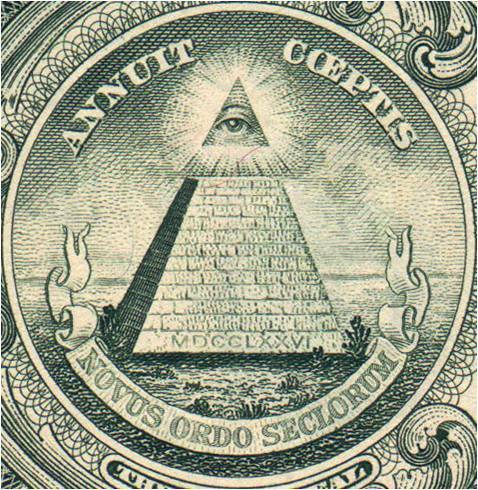 The Illuminati already have flunkies at the executive helms of the major Western democracies. Is their current goal a world in which all heads of state are fully compliant with their agenda? If they could achieve this, the New World Order, with its world government and world currency, could move forward unchecked by a single political opponent. (2) Use war as a scapegoat for the anticipated U.S. economic disaster. As Paul Craig Roberts and many other analysts have been pointing out, the dollar’s collapse appears imminent, and the U.S. economy with it. The privately owned Federal Reserve has, since its establishment in 1913, created trillions of dollars from thin air – “fiat money.” This cash has allowed the government to operate while running trillion-dollar deficits, to fund wars without the need for tax increases, and to bail out Wall Street directly. In 2011, a limited audit of the Fed by the Government Accountability Office (GAO) revealed that, from 2007 to 2010, the Fed gave $16 trillion in secret financial assistance to multinational banks and corporations. Top recipients included Citigroup ($2.5 trillion) and Morgan Stanley ($2.04 trillion). Those aren’t typos; that’s trillions, not billions. Technically, these were loans, but the loans were at zero percent interest, and very little has been repaid. In short, these were essentially gifts that Ben Bernanke bestowed on his elitist friends, without informing Congress or the people. Creating money from nothing is inflation: it devalues the dollar, making prices rise. In 1962, a postage stamp was 4 cents, a candy bar a nickel, tuition at Harvard was $1,520, and the average cost of a new house in America $12,500. As illustrated in this graph by Robert Sahr of Oregon State University, published at http://oregonstate.edu/cla/polisci/faculty-research/sahr/sumprice.pdf, there was no real net rise in U.S. prices from the days of the Pilgrims until establishment of the Fed. Inflationary blips are on the graph, as during the American Revolution, War of 1812 and Civil War, when the United States printed large quantities of money to fund those conflicts. But after the wars, money always returned to its normal value. But look at the graph’s right side. During World War I, our currency inflated, but instead of resuming its normal value afterwards, inflated out of sight. American money, stable for 250 years, began to rapidly and permanently lose its worth. 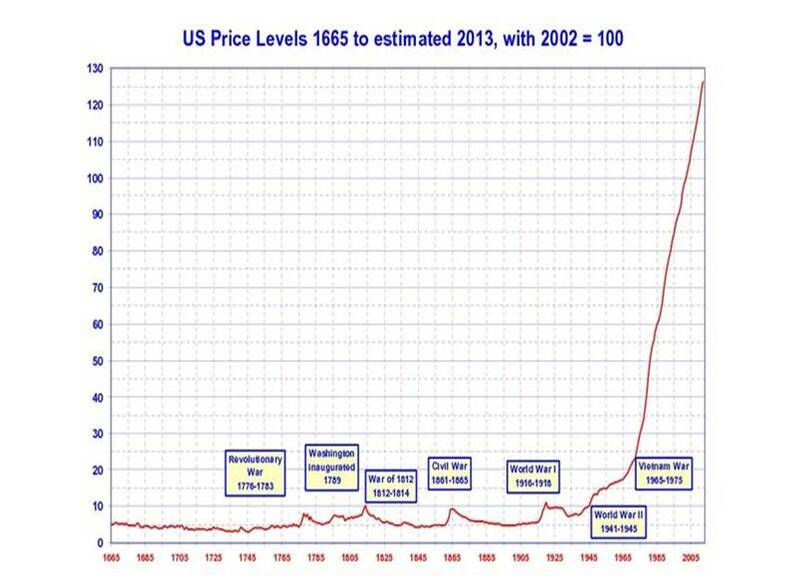 This resulted from the Federal Reserve’s massive production of fiat money. The dollar’s value has shrunk by well over 95 percent since the Fed’s 1913 birth. In reality, the inflationary spike is much higher than commonly believed, because the government has, in recent years, understated the rate of inflation by repeatedly tweaking its methods of determining the Consumer Price Index (CPI). Does anyone really believe the government’s claim that current annual inflation is only 2 percent? However, Americans still don’t experience the full effects of inflation because the dollar is the world’s reserve currency. When the U.S. buys imports, other countries receive payment in dollars – whose value is ever decreasing. Furthermore, due to an arrangement in place for four decades, OPEC nations have accepted payment for oil exclusively in dollars – also known as “petrodollars.” All countries who buy oil are thus required to keep large quantities of dollars on hand. As a result of these factors, the devalued dollar’s inflationary effects are spread throughout the globe, instead of being confined to the U.S. However, the world’s nations are tired of having their economies suffer from reliance on the increasingly worthless dollar. Many countries – led by the “BRICS” – Brazil, Russia, India, China, and South Africa – are planning to abandon the dollar. If that happens, the Fed bankers could no longer get away with creating trillions in fiat currency – there would be no place to distribute it: in America, prices would soar astronomically, and its economy would tailspin. If such a collapse occurs, America’s central bankers would naturally seek to avoid the blame they deserve. They would not want the public to understand that the debacle resulted from decades of their corrupt fiat money policy. So how very convenient if the collapse coincided with a war. CNN reporters could then – reading from pre-written scripts – inform Americans that “the war caused the collapse.” The very banksters who wrought the disaster would then be interviewed as “experts” on what should be done next. (3) Engulf the planet in World War III, in order to induce apocalyptic changes. 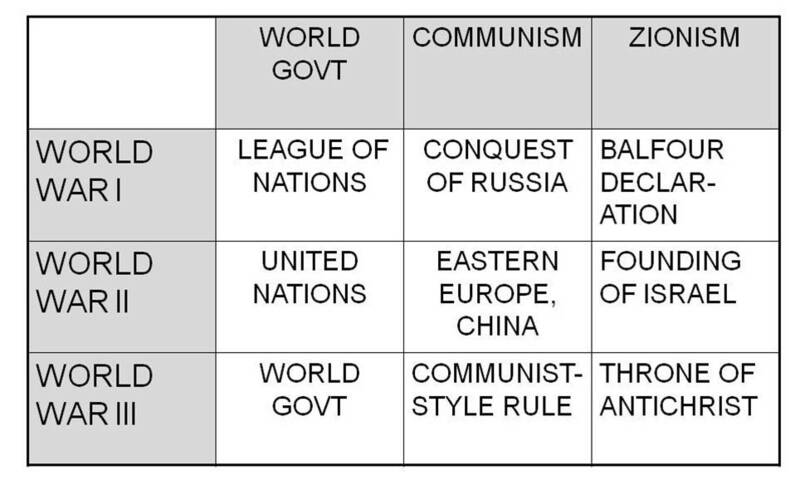 World Government was first established by World War I (the League of Nations); was strengthened by World War II (United Nations), and would presumably be fulfilled by World War III (all-powerful world government). Communism was a tool to overthrow kings, governments and religion. World War I established the first communist state (Soviet Russia); World War II empowered communism and spread it over half the globe; World War III would not end in Marxist communism per se, but would establish totalitarian rule surpassing communism’s worst excesses. To this schematic I suppose we might add Banking: World War I was piggybacked off the new Federal Reserve; World War II created the World Bank and IMF; and World War III would generate a global currency, a planetary “Euro,” possibly in digital form and thus fulfill the Biblical prophecy that no one will be able to buy or sell without the mark of the beast. 2014 marks the 100th anniversary of the First World War. Something as cataclysmic as a world war would likely be necessary to bring about the satanic global state that the Illuminati envision. The question is: Do the current showdowns in Ukraine and Gaza represent the beginnings of that? The conflicts are unusual in that, for both arenas, the prime movers – the U.S. and Israel – are behaving irrationally (not that either country’s previous foreign policy has made much sense). The U.S. is seemingly trying to provoke Russia over issues that are complete “non-starters” (the dubiously explained downing of MH17 and old violations of an old arms treaty). Playing a game of “chicken” with a power like Russia, armed with nuclear weapons, is insanity. Meanwhile, the Israelis are slaughtering the people of Gaza. This allegedly began over the murder of three Israeli teenagers, even though it is increasingly clear that the incident was not linked to Hamas. When a single Israeli soldier goes missing, Israel reacts with dozens of air strikes. Let there be no doubt: this is not a “battle” between Israel and Gaza; it is genocide. Israel has hundreds of tanks and hundreds of warplanes, paid for by American taxpayers. The Palestinians do not have even one tank or plane; their “rockets” are primitive homemade weapons which are all they have to fight back with, and represent no meaningful threat to Israel. Israel’s ethnic cleansing of the Palestinians is certainly not new; but this latest episode seems especially brazen in its savagery. Furthermore, mainstream media has been publishing pictures of the Palestinian victims – something that has traditionally been off-limits. One way to enflame the Gaza situation into a worldwide controversy, of course, is for the media to “play both sides.” Meanwhile, ISIS has overrun much of Iraq, and Libya is in such turmoil that foreign embassies are closing. One gets the impression the Powers That Be may be trying to immerse the Middle East and Ukraine/Europe in so much chaos that it will keep escalating until World War III results. With the world awakening through the Truth Movement and the Internet, the Illuminati may be worried that their time is also growing short, and thus have their foot on the geopolitical accelerator.